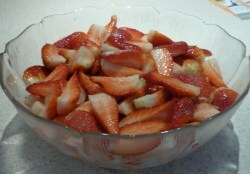 Strawberries and Cream is a favorite Summer Dessert. Strawberries and Cream is always a popular Summer Dessert among the kids on a lovely summer’s day, as a matter of fact over 50% of 7 to 9 year old kids chose strawberries as their favorite fruit. When the fruits are in season, buy the Strawberries at the roadside or you can even pick your own at some places, bring the kids along and make a family outing out of it. Even better, if you have a bit of space in your backyard, grow your own, get the kids involved, nothing tastes better than home grown fruit and vegetables, and if you haven’t got the space in the garden strawberries are ideal for growing in pots as well. Strawberries and Cream is not the only thing you can use the Strawberries for, there are heaps of other lovely Strawberry Dessert recipes. Did you know that there are only 55 calories in one cup of strawberries, they are the only fruits to bear its seed on the outside and carries on average 200 seeds, it is the first fruit to ripen in the spring and the fruit is very rich in vitamin C.
Hull the strawberries and cut them in half or quarters depending on size. 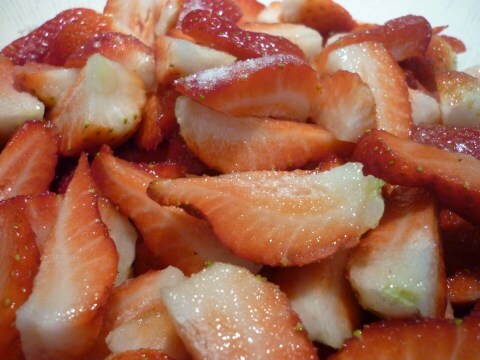 Place in a serving bowl, when you have about half the strawberries in the bowl, sprinkle about 2 table spoons of sugar on top, top up with the rest of the berries and sprinkle another 2 table spoons of sugar on top. Cover with gladwrap and refrigerate for 1-2 hours. Mix the whipping cream and milk together in a little jug. 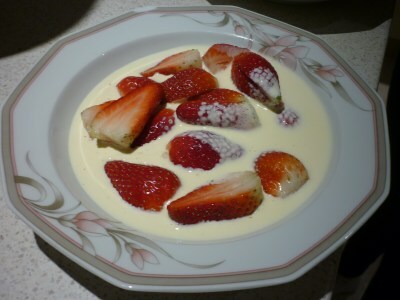 Serve the strawberries in deep plates and pour the cream and milk mixture over, you may have to add a bit more sugar at serving, depending on the sweetness of the berries. Leave Strawberries and Cream and Go To Recipes.